Okay so let me start by disclosing that technically, this Oven Roasted Butter & Herb Corn isn’t roasted corn. It’s moister, It’s simpler, Your oven doesn’t have to get as hot, and for goodness sakes there is no standing over, beside, or even remotely near an open fire in the middle of summer. So technically, this isn’t roasted corn – because it’s a little bit better. But I chose the name “roasted” because it sounded as delicious as this corn tastes. And believe me, I know corn! I’ve been shucking it since I was old enough to hold an ear, picking it and growing it most of my childhood, and we won’t even get into how much I have eaten in my life. I dearly love the stuff. Always have, always will. The beauty of this is that it really doesn’t take any time to prep it and get it in the oven. 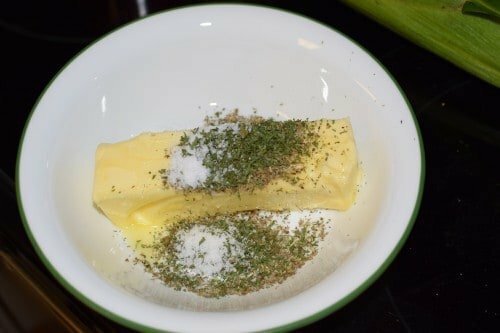 All those yummy dried herbs and that bit of kosher salt mix up with the butter and your fresh ear of corn basically takes a steam bath in it while you do other things. I like to serve it in the foil that it was baked in, just barely popping open the top like you would a baked potato, because all those yummy juices will then rest happily in the bottom, just waiting on you to dip it, like a little herbed butter bath. Before I get to the recipe, I had planned on telling you a story today. It was going to make you laugh, cry, contemplate life, and inspire you with insight and wisdom – but you’re just gonna have to trust me on that Because some days just don’t flow like you’d want them to. Sometimes things I’d like to write about come to me and I send myself quick little emails with outlines or basic ideas to flesh out later in posts. Today I had three gems I really wanted to tell but as I sat down to write, each story seemed to cross its arms and turn its head defiantly away from me. The one story I managed to force ended up far too opinionated to be able to publish so I had to set it aside to edit and tone down for another day. But it’s all good because I have this work philosophy that I live by : Keep moving forward. If something isn’t working for me, rather than swim upstream, I move on to another task and circle back to that one later so that I am always accomplishing something rather than spinning my wheels. Once it became obvious that writing was not going to be my “thing” today, I decided I would go record my Vlog so I could include a link to the latest video in this post. I’ve been doing this Vlog Every Day in May challenge from my friend Conni at Cosmopolitan Cornbread and although my videos have hardly been every day, I have managed to keep up with it pretty well as far as answering the questions go (see the videos here). So I went to take my computer outside to record and lo and behold, my startup disk is almost full. If you are a computer person, I realize that is the kiss of death so I deleted some things real quick but it still makes for bad videos. When my computer is exhausted of memory and I go to record, my audio doesn’t sync up properly with my video and it all ends up looking like one of those bad foreign films where people’s mouths move and seconds later you hear what they said. I know this from experience. Lots of experience. I probably need a new computer but that ain’t happening. Not to be easily swayed, I grabbed my phone and went outside to record on that, thinking I’d sit down on a nice little patch of grass by my chicken coop and let you see the chickens. Stepping out onto the deck, I went to open the doggie gate and it fell off the hinges. Literally. My husband says I probably opened it too hard. Yes. I’m sure it is me. Me and this super human strength of mine and all that. Well that coop I mentioned is a portable one known as a “chicken tractor”. As fate would have it, though, it’s only portable if you are The Incredible Hulk or Thor. I know what you’re thinking “But didn’t your super strength just rip a steel gate off it’s hinges?” Boggles the mind how my strength comes and goes, right? It takes my husband, my son, and myself to move the tractor and even then moving is a slow and strenuous process. Remind me to figure out how to pull wheels on that thing…. This canceled my recording idea because right now it is near a neighbors house and they have a whole crew working on their roof. I didn’t want to be that crazy lady who sat down by chickens and talked to herself for twenty minutes. I’d rather be thought crazy for other reasons and at a later date, if possible. So I grabbed up a chair and set off in search of a new place to record. Nothing. I found one spot and even started filming but the sun was in my eyes and I had that squinty eyed face for five minutes before giving up and heading back to my usual spot where I’ve recorded pretty much every other video for the month. Obviously, variety ain’t my thing today, either. Once there, I couldn’t get my camera to hold still. I tried propping it, holding it, etc. It was shaky and way too close-up for my tastes. Plus, when I looked at myself in the view, I just didn’t like it. I snarled back at how my hair, face, and clothes looked. At that point I realized that this was just going to be one of those days where things weren’t going to go according to my plans and rather than try to forge ahead with how I had planned on it going, the best thing I could do is switch horses and go with the new flow. That means no video today. That means putting my hair up because it is aggravating me being down. That means a few slowly sipped cups of tea, some extra time loving on dogs, and maybe a little break as soon as I finish this post and put my bread in the oven. 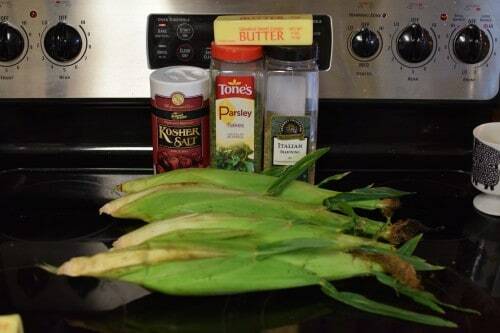 So here is a delicious corn recipe. Without a video or baby chickens or interesting camera locations. But at the end of the post you get corn, and thats a pretty good thing. You’ll need: Fresh corn*, kosher salt, dried parsley, Italian seasoning, and a stick of butter*. *You can use frozen corn for this if you like. Do whatever makes it easiest for you. If you want to know how to shuck this corn, click here to see my post on that. *Butter, unsalted or salted? Eh. Whatever you got. Soften your butter a bit. The best way to do this is at room temp or out in the sun a few minutes. I have found that if I nuke that stuff on one minute at 10 percent power it works pretty good, too ;). Try not to melt it, though. If you end up melting it anyway, stick it in the freezer a few minutes. Place your seasonings and salt on top of the butter. If you don’t like the seasonings I’m using, use seasonings you like in their place. Even just plain seasoned salt would be great in this. Also garlic, basil, etc. You could pretty much open up your spice cabinet and see what falls out and you will still end up with delicious corn. Mash all that stuff together with a fork until it’s really well mixed like this. Oh look! Our corn magically shucked itself following the directions in this post. If you are in the area where I live, this is some beautiful corn I got at Krogers this week for 25 cents an ear. It is delicious and super sweet. 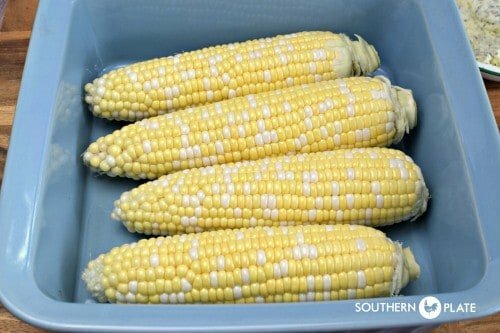 Wal Mart had corn yesterday for 20 cents an ear but I think I’m going to get some more from Krogers because this batch was so good. Take a knife and smear each ear all over with butter. Then wrap each one individually in foil. Place each one in a baking dish with the seam side up. Bake this at 350 for 30 minutes. 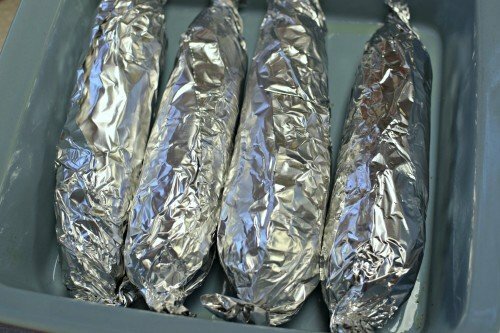 Let sit for five minutes once you remove them from the oven and then peel back just enough foil to make the corn accessible. Serve them in foil so folks can dip their ears in all of that wonderful melted butter! By ears, I mean ears of corn. Things ain’t got that crazy just yet! 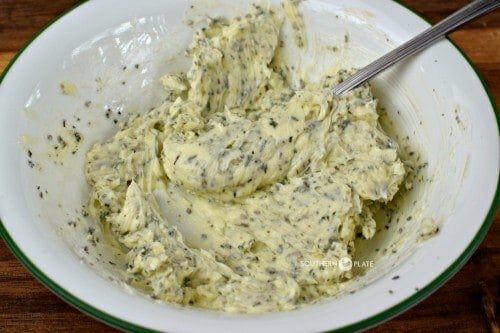 In bowl, mash butter, parsley, Italian seasoning, and salt together with a fork until well blended. Spread this over each ear of corn until covered, and then wrap them in foil. Place ears seam side up in baking dish and bake at 350 for thirty minutes. Allow to sit for five minutes before carefully opening just the top. Serve in foil. *Salt - I use an entire teaspoon but feel free to use more or less based on your preference. I find salt and butter are amazing compliments to corn though! *The above post (where this recipe is found) has lots of substitution options and helpful hints and links to go along with this recipe. Christy, some days are like that…lol. Thanks for the recipe for the corn. I hope to try it this weekend, unless I have ” one of those days “….smile. Wait! Sweetie! Did you just use a whole stick of butter for 4 ears of corn?!!! My goodness, honey, that will make ANY day good!!!! I love corn this looks so good. Our last grill turned into a squirrel nest which rotted out the bottom of the grill so I am glad to see this to be prepared in the oven. Thanks for the recipe. Oh. My. Gosh. I can’t wait to try this! I love corn on the cob (probably as much as you do…I grew up in Indiana where corn is like the staple side dish all summer long) but I hate standing over a pot of boiling water on a hot day waiting for it to cook! This looks amazing. Sorry to hear about your day, but I’m glad to know that I am not the only one who have days like that. Lol. The corn will be on the table this weekend for sure. Thanks for all you do! Question about the bundles. Are these books or online activities? I see some I would like to get for my nieces and nephew for devotion studies. Thank you Judi, I hope you have a blessed day!! In the world of Kim Kardashians, I would dearly appreciate seeing you in your natural state with your hair up and not fussing with it as we who love you can only see your sweet face and beautiful smile. The weather there must be hot and humid like it is here in Ohio and nothing worse than hair sticking to your neck,and forehead and blowing in your face. Save the prepped hair for winter and TV, you are a Godly creation and that is perfection. Wow, this corn looks picture perfect, i know it will taste as good as it looks. Having some right now, because it is one of my favorite dishes. Also they have it on sale. Thanks Christy! I hope you enjoy it Annette!!! Does this corn look good or what?!? Christy, your recipes are always so good! Your attitude and example are even better, Thanks for this. : ) …now I’m shopping my way through that homeschool bundle stuff, thanks for the link! Hi Becky!! I hope you enjoy the corn and the homeschool materials!!! Just wondering if I use frozen corn does it have to cook longer? Love your stories and recipes 🙂 Have a blessed day! I make a similar recipe, except I use fresh, chopped cilantro and parmesan cheese instead of the parsley and Italian seasoning . . . oh, and we throw them on the grill outside instead of in the oven. Delicious! Christy, I made this corn last night and it was easy and delicious! 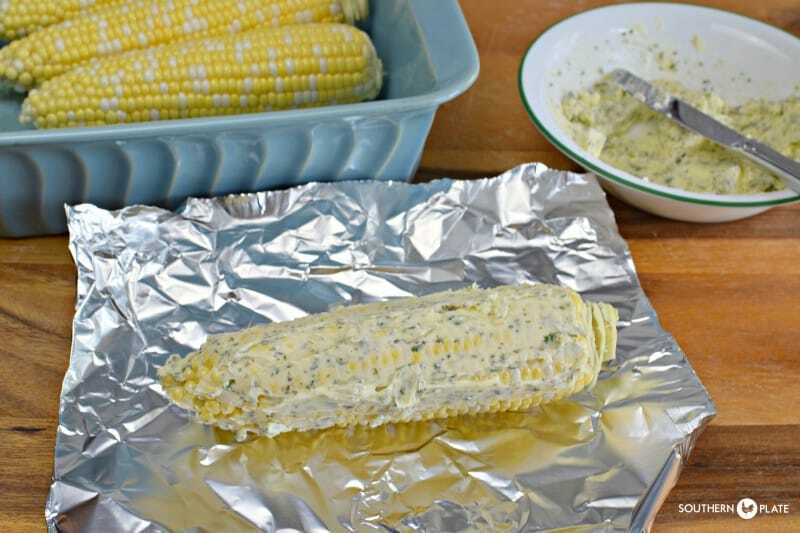 We usually throw foil wrapped corn on the outdoor grill, but this was easier tonight, especially since I already had my oven on for the barbecue chicken I was making for dinner. Right now, I have your Fork Tender Swiss steak in the slow cooker, which I’m finally trying. Looking forward to dinner tonight! Thanks again for all your great recipes! Have a great weekend, Christy! I am so glad to hear that y’all liked the corn Samantha!! Hi, Christy. I just wanted to let you know that we’ve made this corn several times since my last comment back in July and it’s the way we do our corn on the cob now. Actually, my husband always makes the corn for some reason (I hate to husk it, that’s why, lol). 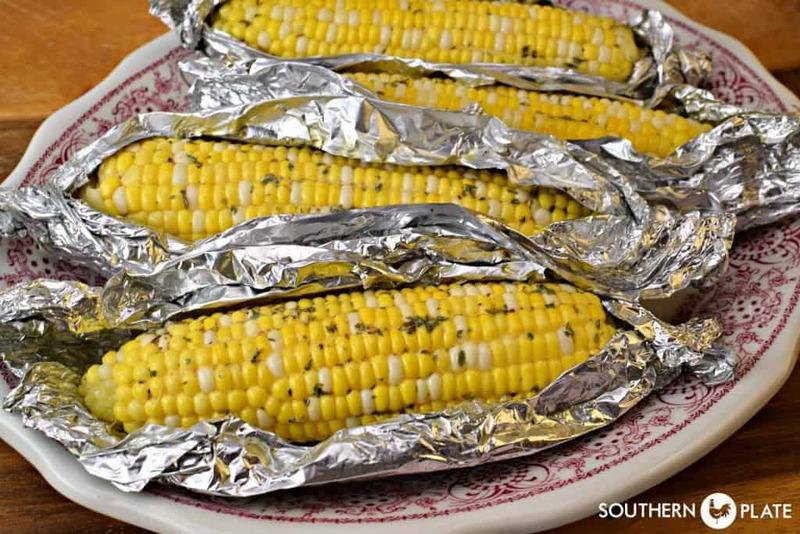 We’ve put the foil wrapped corn in the oven and on the outdoor grill and it’s fantastic both ways. Thanks, again! I am so glad y’all like it Samantha!!! I will follow u right now on Instagram. Didn’t know u were there! Roasted potatoes come out of the oven so why not roasted corn? Tried the oven roasted butter herb corn after church today. The good news is my wife liked it. Used corn I had bought at a farmers market and as usual made a slight change with the herbs I used. Was thrilled that looked like the corn in your pictures. Also had some locally grown green beans, potatoes and tomatoes. Oh my goodness, that sounds like one of the finest meals a body could sit down to!!!!! WOW! Just saw this oven roasted corn recipe in Pintrest. We’re right in the middle of the fresh sweet corn season here and had to try this. EXCELLENT. Definitely a keeper. 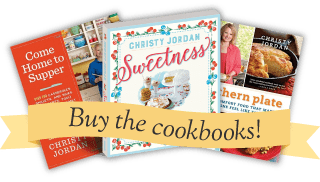 Checked out several of your other recipes (especially your low carb ones) and signed up to get your emails immediately. Look forward to your upcoming posts. Welcome to Southern Plate Judie!!! I am so glad you ran across the roasted corn on Pinterest and came over for a visit, I hope you find many recipes that you love and I look forward to gettting to know you!! !